Reduce contact with a non-perfect axle surface (nail-type axles). We’ll will discuss these points a little later. Anecdotal (and thus questionable) evidence for the benefit of grooved axles abounds. Statements such as, “I used grooved axles and won, therefore grooved axles are better than non-grooved axles”, are commonly made, but cannot seriously be used to prove the benefit of grooving. In this example, any number of factors could have led to the victory; whereas the grooved axles may or may not have been of benefit (they could have actually made the car slower). If grooved axles provide any benefit, there must be some scientific basis. Let’s first look at the three points given above, and then consider some additional possibilities. Reduce Friction – The use of grooves does not reduce friction. The amount of friction present in a system is based on mass and the coefficient of friction (F = mass x COF). The amount of surface area contact does not figure into the equation. So, when grooves are used, the amount of friction is not reduced, but instead the mass of the car is focused on smaller contact patches. Graphite Reservoir – Graphite is most effective when it is thoroughly worked into the wheel bore, and any excess graphite is shed from the system. The introduction of raw graphite (from grooves or otherwise) tends to slow down the car until the break-in and shedding is completed again. Lube Channeling – Excess liquid lube tends to slow down a car (due to the viscosity – thickness – of the oil. If excess lube is used, the grooves provide space for any excess liquid, minimizing the amount of lube that is actually working to reduce friction. Lube Thinning – As discussed in point 1, grooves cause the mass of the car to be focused on small contact patches. This tends to thin the oil between the wheel bore and axle (reducing viscosity), which could lead to better performance in the short term. So, if grooves are of benefit, the reason for the improvement will likely be due to points three through five. In order to prove/disprove the benefit of grooved axles, a controlled experiment must be conducted which eliminates as many variables as possible. Under these controlled conditions, the effect of grooves on axles can be ascertained. An experiment of this type was performed in 2003 (updated in 2004) by Bob Barga.1 The results of this experiment generally showed that grooves were of benefit when using a liquid lube, but were detrimental when using graphite. This experiment also tested the effect of various polishing treatments. In our experiment we will focus entirely on the effect of grooved axles. 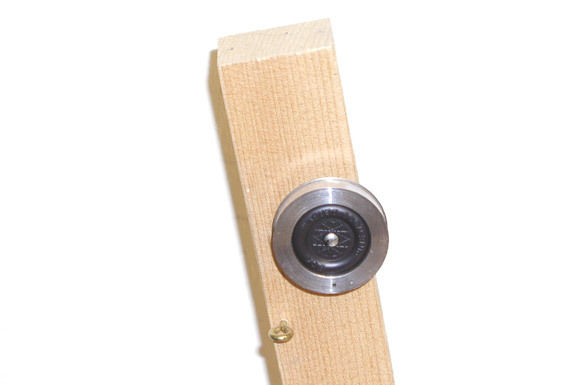 To eliminate variables, the performance of a wheel on an axle will be measured with a weighted-wheel spin jig (see Figure 1). This apparatus consists of a machined steel ring which is sized to fit snuggly over a machined BSA wheel. 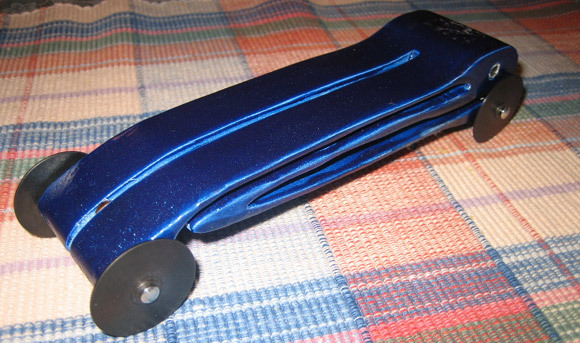 The ring weighs two ounces, which is essentially the load on a rear wheel of a pinewood derby car. After sliding the ring over the lubricated wheel-axle assembly, the axle is mounted onto the apparatus. A length of fishing line with a weight on one end is wound around the ring (there is a small pin on the ring not seen in Figure 1, to which the non-weighted end of the string is attached). On each test, the string is wound until the weight touches the eye hook. The weight is then released and a stopwatch is used to measure the spin time. The string is sized such that it is released from the ring before the weight reaches the ground. The jig is shimmed such that the wheel runs on the axle without touching the axle head or the jig. BSA Speed Axle – Standard BSA nail axle that has been machined to create a smooth shaft. Grooved BSA Speed Axle (4 groove) – Same as above but with the four grooves. Super Speed Axle (smooth) – an oversized (0.091), nickel plated, machined axle. Grooved Super Speed Axle (1 large groove) – Same as above, but with a single wide groove. One of each of the above axle types was lubed with Max-V-Lube Graphite, and the other with Kryox 100. The recommended lubrication method was used in all cases. Referring to Figure 2, the wheels and axles were paired as shown. Thus, wheels one and two were only lubed with Krytox, while wheels three and four were only lubed with Max-V-Lube. Each wheel-axle combination was given several “break-in” spins, and was then given ten timed spins. The high and low times were removed, and then the times were combined and averaged. The results are shown in Figure 2. Note that longer spin times mean better performance. With Krytox 100, grooved BSA axles provide a slight benefit. This is likely due to lube thinning. With oversized axles there appears to be no difference between grooved and non-grooved axles. With Max-V-Lube Graphite, BSA grooved axles provide significant benefit. This is likely due to a reduction in the contact patch. With oversized axles, grooves provide no benefit (or slightly negative benefit — the difference in times is within the experimental variance so a solid conclusion cannot be drawn). Although this was not the intent of the experiment, the data clearly shows that oversized axles perform significantly better than BSA axles. 1The results of the experiment are posted Here. 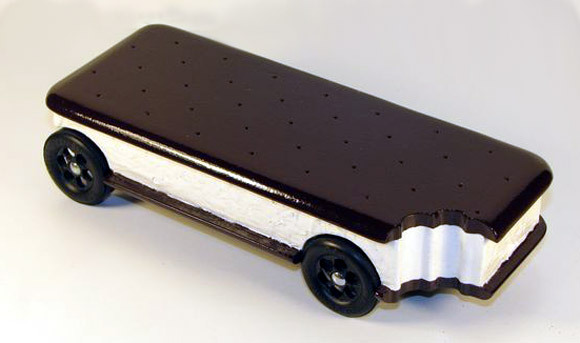 Attached is a picture of my son, Blake’s ice cream sandwich car which he named “Chilly Willy”. It won crowd favorite and took 3rd place in speed. We had to take the photo from the right side to see the bite (which is actually from Blake). He bit into a piece of foam and we traced it to the wood. 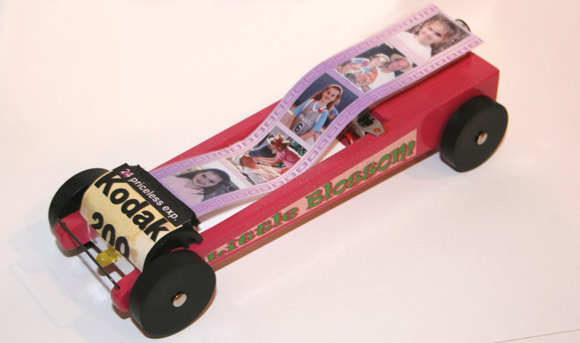 This car competed in my daughter’s Indian Guide Pinewood Derby last year. Since my daughter is getting older and she likely won’t do this many more times, I wanted to create a special keepsake for her. I used clear acetate, and applied a decal I created to look like a filmstrip with some special pictures of our camping adventures together. Also, I used some small watch batteries to power a flashing yellow LED light at the front of the car and two white LED lights beneath the filmstrip. Not only was the car fun to look at, we raced it with outlaw wheels and won! I compete in the open class in our pack which was designed mainly for adults and has very few restrictions. However, there is still a restriction of no external springs. Since we use an older wooden track that is pretty rough in places, cars lose a lot of energy because the entire weight of the car has to go over every bump. This year I tried a flex design. By doing some clever cutting and a lot of sanding, the car has four-wheel independent suspension — each wheel can flex and move more than 1/4 inch. With this design I was able to move the weight further back on the car (the wide area at the back is filled with lead) without fear that it would “pop a wheelie”. It also absorbed track bumps without losing much energy. Although from the picture it may look fragile, it is actually quite strong and won every race by well over a car length. When I was a young boy in cub scouts, derby time came. So like many other kids my dad helped me build my car. Because of my health problems, my dad worked two and sometimes three jobs, so spare time was a rare thing. As a young kid I didn’t understand why it seemed like I was having to build the car on my own (besides, I wasn’t doing such a good job of it). I didn’t know it then, but I had the very best in fathers. He helped me every chance that he had, but like I said, his time was in short supply. Anyway, the car finally was built and ready for paint. I was sort of on my own again for this, and I really messed it up bad. My dad saw it and said it wasn’t so bad, he would just sand it off and I could start over again. Nobody told me how to paint though, so it came out worse the second time around, and I also had run out of paint. As ugly as it was, things got even worse. Race day came and I wasn’t going to take that ugly car to the derby. I am not sure which of my two older sisters or my mom came up with the idea that fingernail polish might cover the bad paint job — and that it dried really quick. Just as soon as I got home from school I started trying to make things better with some horrible color of fingernail polish that one of my sisters had given me. It got worse and worse. I kept piling on more of that thick gooey stuff. The polish would dry and I would put on more. It looked horrible. Nothing more could be done at that late date and even though I was very unhappy with the final results, we had to go race it anyway. One of the first things I can remember when we got to the race was the cars that two friends of mine had brought. They were absolutely beautiful, formed so well and the paint was perfect on both of them. But both of those cars were eliminated before the race because that had not complied with rules and had used really trick slot car wheels instead of the plastic wheels required by the rules. During the race, my car won races up to one of the very last rounds. The little ugly car smoked so many others, and not by just a little. I was so proud of it then even though it was hard to look at. This is not the end of the story, although I guess it could be. Years later, derby time came around for one of my nephews. I helped him build his car (in other words I did almost all of it myself). It was perfect, sanded with 1000 grit paper, weighted perfectly on a digital scale, and the paint was so perfect. The car turned out great. Race day came for my nephew and as we were having the cars inspected before the race someone doing the inspections mentioned to the crowd that these were some very good-looking cars that the “boys” had built. Then he looked right at me. He knew that this was my creation, not my nephews. The race came and went and we were almost happy with the results. It turns out that the fastest car that night turned out to be the second ugliest car in derby history. Right behind the one I built when I was young. In your opinion, what is the fastest axle for RA Racer wheels? We have tried the Super Speed Axles, but the width of the RA Racer wheel hub is a little short for these and doesn’t ride well across the grooves. Assuming that your rules allow you to use axles other than those supplied with the kit, you can use Awana Axles. They are straight and defect free, and similar in diameter to the RA Racer axles. I have a stock block with your axles and wheels — the light weight BSA wheels. I aligned the axles with your tool. I have your basic speed kit and Speed to Finish booklet. I used graphite as recommended. The car is running a consistent 2.68 second down the track, I only varied from 2.65-2.69. The problem is I need to be about 2.5 seconds to dominate the field. I’m limited to stock wheel base. Can you turn me on to any hot tricks? If you are running 2.65 to 2.69, it may not be feasible to get to 2.50. However, you might get close using the “Rail Riding” technique. For information on this technique, take a look at the main article in the newsletter posted Here.